Since partnering with Wizards of the Coast to convert the official Fifth Edition campaigns into Roll20, the Roll20 modules have been released out of order. Each of the campaigns are technically stand-alone, but some events and characters are referenced in other stories, such as Artus Cimber and the Ring of Winter in Storm King’s Thunder and Tomb of Annihilation. Princes of the Apocalypse is the Fifth Edition adaptation of the classic “Temple of Elemental Evil” campaign story, which is basically one big, sprawling, interconnected mega-dungeon featuring four elemental-themed cults. Each cult has their own prophet, and is trying to bring their respective elemental god into our world, which is bad news for everyone. The players start out on a search and rescue mission before diving into a series of huge dungeon crawls to thwart each of the cults. For those of you that have been following my D&D adventurers over the years, you know I DM’d a full campaign of Princes of the Apocalypse through Roll20. Of all the Fifth Edition adventurers, this is the one I’m most inanimately familiar with. How does the official Roll20 module stack up? Nearly 200 NPC monster sheets with draggable tokens, vision, and separate player handouts. Sadly the original random encounter maps included in the previously released Tyranny of Dragons Roll20 modules aren’t present here. However, on the flip side Princes of the Apocalypse is a very dungeon-heavy map as is, with the mid and late game dungeons being particularly gigantic. As usual there’s a START HERE section with a few notes on the module, including Token Settings, Map Settings, keyboard shortcuts, and notes for creating custom macros. Princes of the Apocalypse isn’t the most well-organized adventure. Chapter 1 introduces the four elemental cults and their prophet leaders as well as an overall synopsis of the adventure. There’s also an entire subsection of player handouts that include pictures with captions, though you probably won’t use most of them until later in the adventure. In fact each chapter includes a handful of player handout pictures, with GM captions. PotA has lots of great artwork and it’s nice to see them all easily found to show your players when the time is right. I definitely wish I had all these pictures readily available when I ran my campaign. Chapter 2 is all about Red Larch, the hub town of the adventure, and the surrounding Dessarin Valley that the entire campaign takes place in. You’ll need to reference this section frequently as your players travel. Chapters 3-5 cover the meaty dungeon crawls that take up the majority of the campaign. Each of the four elemental cults has three dungeons of ascending difficulty, and another dungeon that links everything together. That’s 13 interconnected dungeons! Not to mention various side quests and adventures. It’s a dungeon-crawlers dream campaign. On the flipside, it’s difficult for players to tell when they’ve suddenly dropped into another dungeon that’s far stronger and more powerful, and easy to get constantly sidetracked and lost. Chapter 6 covers the intro level 1 content around Red Larch as well as the various side quests that go all the way up to level 11. Again, you’ll have to reference this section throughout the campaign if you want to use these excursions (I skipped half of them when I ran it). The major overland maps are the Dessarin Valley, Red Larch, Red Larch Surroundings, and the Sighing Valley. These include all the hidden token and map features we’ve come to expect from the Roll20 modules. Unlike Chult, the Dessarin Valley region is a mapped-out, civilized region, so PCs would most likely know (or have seen on a map) the location of major cities and roads. Even so, all the cities, names, and even trails were hidden on the GM layer, giving the DM the option to hide whatever information they wish, revealing them as their player’s explore. It seems a bit overkill, but I’ll never complain about giving more power to the DM. One nice perk is that this Dessarin Valley map uses the new Eratta’d version that was officially released later. The original map had some annoying quirks that didn’t make sense once you read the adventure. Namely the entire overland scale was completely wrong, and the location of two of the topside cults didn’t seem to be right. 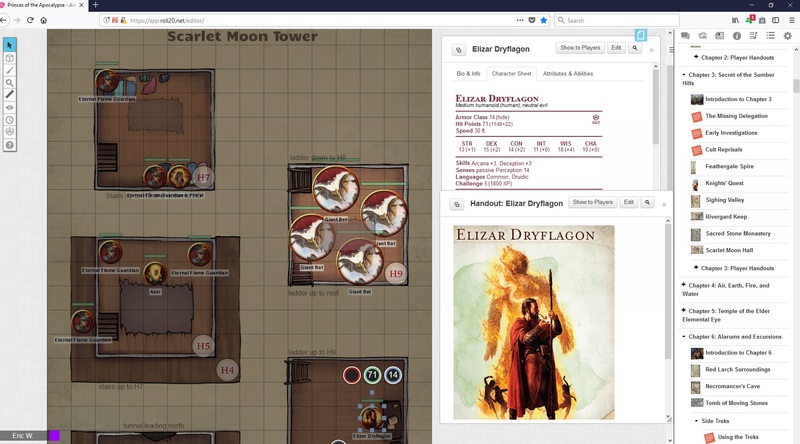 Thankfully Roll20 uses the new and improved version. A single blank random battle map is included. It’s at least one step better than a literal white grid, but still lacking compared to the ones included in Tyranny of Dragons, which I’d hoped would become standard. As I mentioned previously, the need for random battle maps isn’t as great in this campaign, but I still ended up forging quite a few battle maps in my adventure. For example, I used smaller mountainous maps for the Sighing Valley and Sumber Hills, road maps on the roads, boat/water maps for river travel, and city maps whenever the cults attacked with their elemental nuke bombs. The standard token page is included, letting you easily copy and paste whatever monster you need, though you can also easily drag them directly from the Journal. There’s also an additional random token page, which specifically organizes the tokens used in random travel encounters. They’re further organized by Early Travels, Late Travels, and River Travels, just like the book. Very glad this has become standard for Roll20 modules. All the dungeon maps feature NPC tokens, DM annotations, Dynamic Lighting (for subscribers) and support for the new Advanced Fog of War (off by default). This is an incredibly huge time saver as these dungeons are absolutely massive and filled with a large variety of nifty creatures, and the single biggest selling point this module has to offer. There are also additional notations on the dungeon maps that explain where they connect, which can be confusing even to DM’s. The Fane of the Eye in particular explains, using written notes right on the GM layer, exactly where the exits and entrances lead. 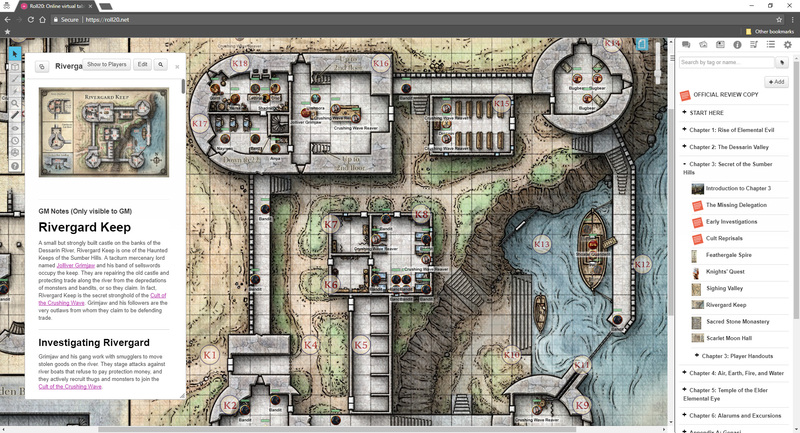 The one nifty extra map that is added into the Roll20 module is the inside of the Scarlet Moon Hall, the top-most dungeon of the fire cult. I’m also very impressed with how the exterior Scarlet Moon Hall dungeon has been converted – it’s properly darkened, lit only by the campfires, and each of the druids are rollable tokens, as most of them are in disguise. Some are cultists, some are bugbears, and others werewolves. Rollable tokens make it easy to flip them to unleash a nice surprise on your players when they approach. The only map for the inside of the hall in the published campaign is the side view, which is weird at best, impossible at worst for Roll20. Thankfully Roll20 came through and custom built a full map for each of the four levels. It’s a tiny map but still a hugely thankful addition. When I tried to create one for my campaign it was ugly and awkward; this one is much better! With the incredibly large number of NPC sheets, artwork, and mega-dungeons, Princes of the Apocalypse may be the best valued module to date. It has one of the weaker stories but by far the most impressive dungeon crawls. Story is far easier to add in Roll20 than physical maps, making PotA an easy adventure to mold and modify to your liking. I highly recommended it as a massive time-saver for running this fun campaign. Staggering amount of content, including tokens, maps, and art handouts. Macro buttons for every random encounter situation in the campaign. Full token page, and additional random token page organized by travel table. 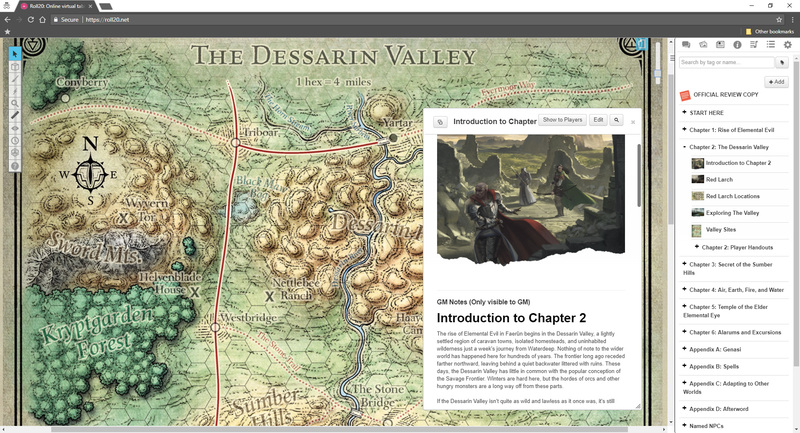 Dessarin Valley map uses the updated Errata’d version, with everything on the GM layer for more DM options. All-new custom built map for the Scarlet Moon Hall interior. No additional random battle maps. Most named NPCs lack pictures, with their name displayed on the token. The Verdict: As a Massive multi-dungeon crawl Roll20’s Princes of the Apocalypse module provides incredible value with an impressive amount of ready-to-go maps, tokens, and character sheets. 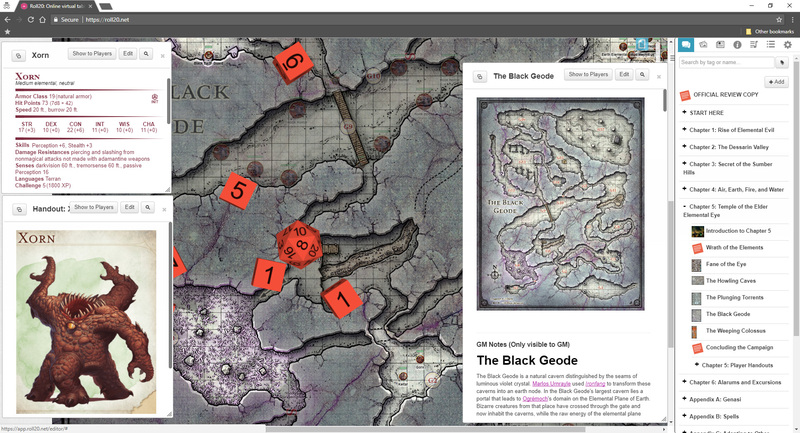 The random maps are now available as a perk for Pro subscribers as an add-on to any campaign. I believe that is why they weren’t included directly, but can be dropped in to any game as an add-on as long as you are a pro member. The addon is called the Roll20 Pro Map Pack. I think it was mentioned in one of the weekly updates on the forum.